President Trump addresses the media as he leaves the White House on Thursday en route for a trip to the border in Texas. Politicians often have to change course when their campaign promises run up against reality. But when President Trump ran for office, and throughout his presidency, an explicit part of his pitch was that he wasn't like all the other politicians. Trump's "great wall" was a big concrete symbol of that. Except that now it isn't even concrete. In recent weeks, he has been saying it will be made of "beautiful" steel slats. The way Trump has described the wall has changed a lot over time, to the point of contradiction. That includes how the wall will be paid for. 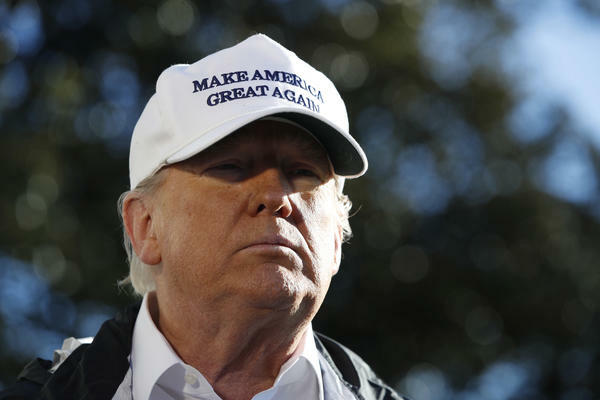 The president is now in a battle with congressional Democrats to approve $5.7 billion in funding for a physical barrier, placing the wall at the center of a lengthy government shutdown that Trump is struggling to find his way out of. In April 2014, when businessman Donald Trump was toying with running for president, he told an audience in New Hampshire that he would "build a border fence like you have never seen before." That summer, a couple of Trump's advisers came up with the idea of calling it a "wall" as a way of signaling Trump would be an immigration hard-liner. "And what better way than to have his brand incorporated by Donald Trump saying, 'Yeah, I'm going to build a wall. Nobody builds like Trump'?" said former Trump adviser Sam Nunberg. The advisers wanted to ensure that every time he gave one of his wide-ranging, largely unscripted speeches, Trump would hit the theme of being tough on immigration. "Build the wall" — like "Make America Great Again" — was easy to remember and would fit well in the "Trump variety show," as Nunberg described Trump's rally speeches. "It was fun. It was cool. It was novel," said Nunberg. Nunberg wants to be clear: Trump rejected plenty of their ideas. But he went all-in on the wall. In August 2014, Trump sent his first tweet about building a wall. Fittingly, it was in all caps. SECURE THE BORDER! BUILD A WALL! A few months later, he tweeted again, adding a little more detail. The wall would be "massive," and the funding would come, indirectly, from Mexico. Trump officially launched his campaign in June 2015, with the wall as a centerpiece. "I would build a great wall, and nobody builds walls better than me, believe me, and I'll build them very inexpensively," Trump said in the gilded Trump Tower in New York. "I will build a great, great wall on our Southern border. And I will have Mexico pay for that wall. Mark my words." It didn't take long for crowds at his rallies to chant, "Build that wall, build that wall!" Sometimes he'd add a question about who was going to pay for it. And arenas full of supporters would respond: "Mexico!" A section of the reinforced U.S.-Mexico border fence as seen from Tijuana, Mexico, on Sunday. Dec. 2, 2015: At a rally in Virginia, a young boy asked him, "What are the walls going to be made out of?" Trump replied, "I'll tell you what it's going to be made of. It's going to be made of hardened concrete, and it's going to be made out of rebar and steel. And — you know, it's so easy, that's what I do." Jan. 18, 2016: "They have no idea how to do it. Whereas with me it's easy — that's like easy. When you build buildings like I build buildings, believe me, walls are easy. No windows, no nothing — precast concrete going very high." Aug. 11, 2016: "The politicians would come up to me, and they'd say, 'You know, Donald, you can't build the wall.' I said, 'You have to be kidding. You have to be kidding. Concrete plank, you have to be kidding. Precast, precast, right? Boom. Bing. Done. Keep going.' "
After Trump became president, though, a dose of reality met his concrete wall. Trump's description of the material started to change. He began referencing a barrier made of steel, rather than concrete. In part, he argued, so that border agents could see through the barrier. "One of the things that's come up pretty strongly is we want to have vision through the wall, because you want to see what's on the other side of the wall," Trump said in an interview on Fox News on Nov. 2, 2017. "You know, you think we're going to build a nice, simple concrete wall, but it's not that simple." A series of tall, steel bollards (posts) is technically more like a fence than a wall. Still, Trump kept calling it a wall and kept leading chants at his rallies all through 2018. But now, with Democrats refusing to fund the president's wall, he's insisting: "We are not building a Concrete Wall, we are building artistically designed steel slats." A day before the shutdown went into effect, the president even went so far as to tweet a clip-art-style rendering he said was a "design" of the steel slat barrier. Again and again, Trump said during the presidential campaign that Mexico would pay for the wall, one way or another. Now the government is partially shut down with Trump refusing to sign legislation to reopen it until Congress provides funding to build the wall (or steel slat barrier). "Obviously, I never said this. And I never meant they are going to write out a check. I said they're going to pay for it. They are," Trump told reporters on his way to visit the border in Texas on Thursday. How would Mexico pay for it? During his campaign, Trump said the U.S. would compel Mexico to pay for it by restricting the flow of remittances, money sent to family members in Mexico by those living and working in the U.S. 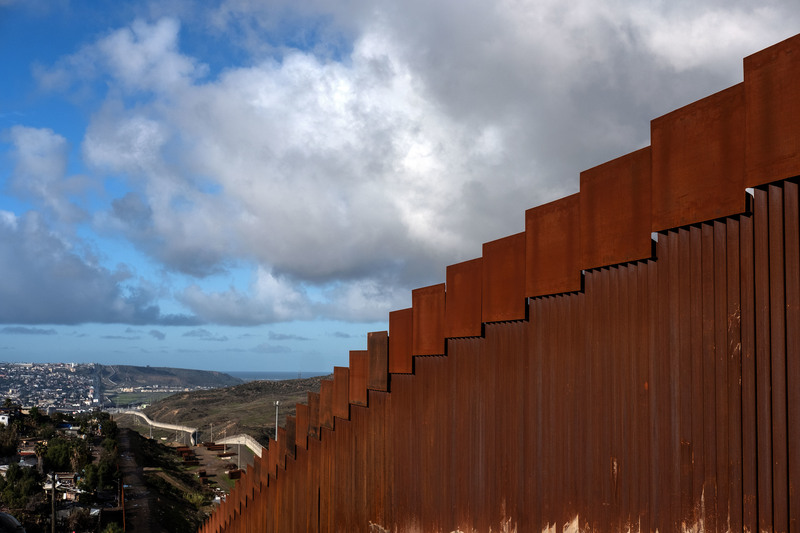 Recently, Trump has said the wall would be paid for indirectly through the U.S.-Mexico-Canada trade agreement, which hasn't yet been ratified, and which economists say is unlikely to dramatically increase U.S. economic growth. "They'd be angry at me"
Steel slats. Steel barrier. Concrete. Does the difference matter to the people who elected Trump to build a wall? "No, it doesn't matter," said Nunberg, the early Trump campaign adviser. "What matters is that there's something built that is not like anything that is built before. That is bigger. Grander." Nunberg doesn't claim to speak for all Trump voters. He's looked at recent polling and focus groups and says the wall is still key. "Trump supporters define success on the border as building the wall, and he has to build the wall or get the wall started," Nunberg said. Trump's political future may well depend on it. Even Trump said as much. "If I did something that was foolish, like gave up on border security, the first ones that would hit me are my senators," Trump said Wednesday in the Oval Office. "They'd be angry at me. The second ones would be the House. And the third ones would be, frankly, my base and a lot of Republicans out there, and a lot of Democrats that want to see border security."